As strawberries are packed with vitamin C, they are highly beneficial for the skin. Plus, the alpha-hydroxy acids present in this luscious fruit help exfoliate the skin. In addition, it contains ellagic acid that protects the skin from UV rays. Furthermore, beauty care recipes prepared from strawberries clear up acne and reduce greasiness on skin. One of the simplest ways to use this fruit on your skin is to rub mashed strawberry pulp on your face and neck as a scrub. Rinse it off with lukewarm water after a few minutes to get beautiful soft skin. Strawberries are the angels of the earth, innocent and sweet with green leafy wings reaching heavenward. Strawberry works as a fabulous natural toner and moisturizer. It makes your skin look younger and brighter. It also helps heal under-eye circles and puffiness. Besides, eating fresh strawberries tends to whiten your teeth and removes bad breath. 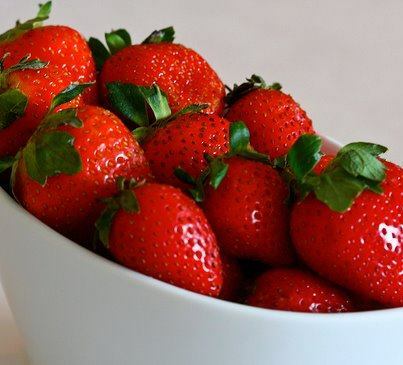 • Strawberries are rich in salicylic acid and hence considered effective in natural acne treatment. So, you can prepare a facial mask at home by mashing five ripe strawberries, and adding a tablespoon of honey and squeezing a quarter piece of a lemon in it. Generously apply this paste on your face. After 10 minutes, rinse it off with warm water. Follow this therapy about two times in a week to cure acne. Check out this video showing how to make an easy strawberry facial mask at home. • Take seven or eight ripe strawberries and mash them in a bowl using a folk. Next, mix two tablespoons of organic honey, one tablespoon of sweet almond or olive oil, and a few drops of lemon juice in it. Apply this recipe on your face and neck. Finally, wash it off with tepid water after 10 minutes. • Blend half a cup of strawberries along with a tablespoon of sour cream and apply the resultant face mask on your skin for about 20 minutes. Follow this procedure on a weekly basis to rejuvenate the skin. • Combine a quarter cup of fresh strawberries and a ripe banana. Mix a quarter cup of sour cream or non-flavored yogurt, and a tablespoon of honey in it. Finally, smear this paste your skin and wash it off after 15-20 minutes. Use this procedure at least once or twice a week to reduce blemishes naturally at home. • Take about five to eight strawberries, mash them with the help of a folk and add three tablespoons of honey in it. Leave it on your skin for about 10-15 minutes and then wash it off with lukewarm water. Finally, use a toner and moisturizer. • Another simple DIY strawberry face mask recipe involves making a mixture of four to five strawberries, half a tablespoon of plain yogurt, and two teaspoons of honey. In case you have dry skin, use heavy milk cream instead of yogurt. • Take 3/4 cup of sliced strawberries, and one tablespoon each of light cream and cornstarch or rice flour. Blend the ingredients to form a smooth paste. Smear this paste on your skin and then wash it of after 10 minutes to get soft, smooth, and glowing skin. • You may simply use a combination of half a cup of strawberries and a quarter cup of cornstarch. While blending, you can add a little raw milk as well. Apply this skin care recipe on your face and leave for about half an hour to get rid of excess oil from skin. You can create more facial masks by adding ingredients like sugar, finely ground oatmeal, egg whites, cocoa powder, rose water, fuller’s earth, and various other fruits in mashed strawberries. Although strawberries pamper and benefit your skin greatly, avoid applying this fruit on sensitive, broken, or sunburned skin. Needless to say, spread a strawberry face pack carefully on your face and neck, keeping away from eyes.